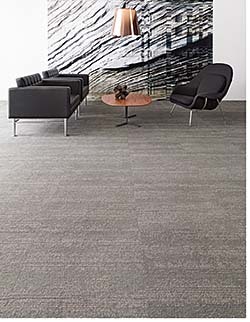 Phases collection of carpet tile is available in three styles: Filter, Migrate and Nuance. Tiles are 24-by-24 inches, using multi-level pattern cut/loop Eco Solution Q nylon fiber at 1/12 gauge with 9.5 stitches per inch on EcoWorx tile backing. Fiber is 53 percent solution dyed. Cradle to Cradle Silver certified.